Often, leagues for 7-11 year olds will play on a smaller field, typically around 70 yards by 45 yards or smaller. The goals are typically 7’ x 21’, and there are only eight players on the field, instead of 11. The fewer players allow for more involvement and touches by the young players. Many youth coaches have only played 11 V 11 and struggle to determine what is the best formation to use at this age group with only seven position players and the keeper on the field. This article looks at one formation, the 3-3-1, and examines how the skills that you need to teach at each position. 1. Pushing Up – one of the keys to making the 3-3-1 effective is to keep the play in your team’s offensive end. The three defenders need to be near or at midfield when the play is your offensive end. You also need aggressive outside defenders who will anticipate and react to a ball coming out of the offensive zone as they put it back into a scoring positing. The more speed the outside defenders have, the more they can push up, especially on corner kicks or throw-ins deep in your offensive end. The center fullback typically would be at the midfield line with play in your offensive end to be ready to play a through ball. 2. Jockeying – young players tend to run at the dribbler and take a swing at the ball. 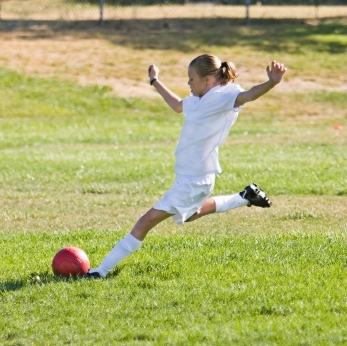 Even at a young age, many players can take advantage of a lunging defender, make a quick move, and be by the defender. You need to teach your defenders to not lunge for the ball but get square to the offensive player, bend their knees, and wait for a missed dribble to take the ball away from the offensive player. When determining your defenders, the center fullback must keep the offensive player in front of him and not lunge. 3. Playing a Ball In the Box – as a coach, you will soon see what players are suited to act quickly and take the ball out of a threatening situation. That is a critical skill for the defenders. You need defenders who get a sense of urgency and increase their intensity when the ball is in the box. a. Always Go Outside with the Ball – The number one rule you need to teach your defenders is that for balls in the box, to turn the ball to the outside of the field. NEVER put the ball back into the middle. That one understanding will save countless goals, even if when they turn the ball outside and it results in a throw-in. That’s far better than to turn the ball into the middle and lose the ball in the box. b. Prevent or Block Shots – The second critical skill defenders need to be taught is to get on the shooting foot of the offensive player. The mentality of the defender needs to be if the offensive player is allowed to get a good strike, it will result in a goal. You need defenders who are committed to not allow this to happen by playing tough defense, forcing the offensive player out of the middle, and being prepared to block shots. c. Field Awareness – Finally, you need defenders who have good awareness of where the threats are coming from. A smart, highly skilled center fullback is critical in this defense. This position is the leader of the defense and needs to learn to move the other defenders into the proper position, is tough to beat off the dribble, takes command during dead ball situations, and battles for loose balls in the box are the skills and mentality you want to develop in the center fullback position. The 3-3-1 formation employs three midfielders. With only eight players on the field, these three positions are critical because they play offense and then quickly transition to defense. Here are some guiding principles and skills sets of the outside midfielders and the center midfielder. a. Field Awareness – the center midfield position needs to be manned by a player who has great awareness of what is going on around him. Offensively, the center mid needs to be aware of who is making runs, what give-and-go opportunities are presenting themselves, and when to not force play on one side but instead change fields. Defensively, the center midfield needs to control a large portion of the middle of the field. They have to understand who the offensive threats are and mark or make sure someone is marking that player. b. Passing Ability – The center midfield is like the point guard in basketball. They will possess the ball more than any other player and need to be able to take a controlling dribble, keep their head up, and make the appropriate pass to move the offense down field. c. Transition – You need to have a center midfielder who can run and run and run some more. As soon as possession is lost, they need to immediately drop and play defense. Coach Anson Dorrance once scouted Mia Hamm in high school and knew she was going to be a great player before she even touched the ball in the game. Within the first 15 seconds her team transitioned from offense to defense and she quickly sprinted to a defensive position. She didn’t take two or three more steps away from the play and put her head down in disappointment because her team lost the ball. She was EAGER to transition to defense. That is the mentality you want to develop in this position. d. Stamina – This position involves the most running, one-on-one battles, and physical play of all the positions. You need to develop conditioning in all your players but you are looking for a player who can really put forth great effort on the field over the entire game. e. Aggressiveness – The middle of the field is where most 50/50 balls will take place. You need to develop a center midfielder who wants to win those battles. Some players will be motivated by scoring a goal, this position needs to be motivated by winning a ball. They need to want to control the ball in the air and are not afraid of physical play. a. Speed – When an offensive push is being made, the success of the 3-3-1 formation is based on getting the ball out of the middle and to the outside. That is where the most space will be on the field. This position needs players who can cover lots of ground quickly. As you are developing players, the outside midfielders may not quite have the foot skills of your defenders, but they need to have the speed because they are forced to cover much more space than the defenders. b. Shooting Ability – In this formation your outside midfielders play the role of outside forwards in 11 V 11. Therefore, they will be required to take some shots on the move. Work on developing their striking ability, since that is critical for both a shot and a cross. c. Crossing Ability – not only does the outside midfielder need to have the foot and ability to make a cross, they need to know if they should take the ball to the end line and then cross it, or at the corner of the box to cut towards the goal and look for a shot or slide a pass to the center forward. They will also typically be taking your corner kicks so really work with your outside forwards on getting the ball off the ground and deep into the middle of the goal area as possible. Ideally, you will want a left footed player on the left side, but if you don’t have a player whose left is their strong foot, really work to develop the weak foot of your outside midfielder. d. Beating the Defender off the Dribble – Teach your players at this position one or two good offensive moves that will beat a defender. Often, a give and go will put the outside midfield in a position where the need to beat one more defender to become a scoring threat. If they have even one move that they can work on that will help them beat that defender, they will be much more successful. e. Transitioning to Defense – It is critical that when transition from offensive to defense occurs, the outside midfielders are sprinting back to defend. Therefore, they need to be well-conditioned and recognize what to do on a chance of possession. a. Controlling the Ball – It takes a lot of work to move a ball from the defensive end into a scoring position. The center forward needs to be very strong on the ball and not give up possession easily to maximize all the team’s work to get the ball forward. Often, there will be two or three defenders collapsing on them so they need to be able to shield the ball, receive physical play, and still make a strong offensive move. b. Striking Ability – In the 3-3-1, often the center forward is getting the ball near the edge of the box. The ability to make one controlling dribble to separate from the defenders and getting off a solid, quick strike on goal separates a good center forward from an average one. Again, at this age level, a strong shot on goal, especially in the corners, often results in a goal. c. Checking to the Ball – The tendency of many young center forwards is to run away from the ball, looking for a through ball. Teach your center forwards to check to the ball. If the right midfielder has the ball working down the sidelines, instead of having them beat two defenders to get to a crossing position, teach the center forward to check to them and then do a give and go to put the ball in the same scoring position as a result of the cross. Also a good play is for the center forward to check to the center midfield who can pass the ball and then make an overlapping run. The center forward needs to control and shield the ball, allowing time for the run to happen. d. Aggressiveness in the Box/Scoring Mentality – There are some players that intuitively find ways to put the ball in the back of the net. Some other highly skilled players struggle finishing a shot in the box. Look for a player who seems to become more focused and aggressive in the box and finishes shots well. Just as defenders need to heighten their focus and energy when the opponent has possession in the box, you need a center forward that has a sense of urgency in the box. They demonstrate a burst of energy and speed to cut the defender off and get a foot on a lot of balls. A final thought is to teach the entire team how to shift and maintain their positions and spacing regardless of where the ball is on the field. If the ball is on the far right side of the field, the left fullback and midfielder will want to be nearly in the middle of the field. As the ball goes to the middle, the entire team shifts back to their starting position, and when it goes to the left side, the right midfield and fullback pinch in to the middle. A great drill to teach shifting is simply to have eight positions start in the beginning positions in a 3-3-1 formation. You can use just half the field to set your team. You can put two players at a position, but they need to act as one player and move together. Set up four pennies on each side of the field at the far side of the box extended. Have the keeper (or the coach if the keeper can’t punt to the defenders) punt the ball to various places on the field. Players need to control the punt and get it on the outside of the pennies to a teammate. The coach should emphasize using the space on outside of the field, which is not as heavily defended. When the ball gets to the outside, make sure that the opposite side players pinch into the middle. As the ball moves up the field, make sure spacing is maintained, the defense moves up, and the center midfield is checking to the ball and not getting to close to the center forward. The team then tries to cross or get the ball in a scoring position and a player takes a shot on the keeper. If it saved the keeper punts the ball back in play and the team needs to transition back to their original position. You can add two to four defenders as well, to make the drill simulate game like conditions. 34 Responses to What Is the Best Formation in 8 V 8 Soccer? my pint of view about formation, you must select the suitable formation depend on your players mentality .and the players of the other team playing against yuo.but your team backborne should be fixed. This is great information! I have been looking for an article like this for quite some time now and have finally found it. Our system is 7v7 for U9’s. What would be better 2,3,1 or 3,2,1 formation. Please advise. When I coached last spring U9 boys, we started the season 1,2,1,3. I would bring my defenders up to just shy of midfield. We didnt have too many points scored against us, but we were 0-5, losing 3 games 2-1, one game 4-3, and one game 1-0. . The last 3 games I simplified it, switched the 1 from a defender to another offensive player, (almost like a 1,2,4). I Had my defenders stay back around the goal box until the ball came within striking distance, where the closest defender would attack the ball and the other would move in the center, prepared to back up the attacking defender, yet also close enough to move back into his position if the ball was passed to the other side of the field. Yeah, the ball would get closer to the goal, but the defenders usually kept the oposite team struggling just long enough for my offense to transition to the other end of the field. The extra body on offense worked out pretty good as well, for we played the majority of the last 3 games on the opposing side of the field. We finished the last 3 games 2-0-1, winning 4-0, 2-0, and tied 1-1 with the team who not only took first in the league, but ended the season at 7-0-1, ruining their perfect season. I’m coaching again this spring season, this time U10, and fully plan on using my 1,2,4 system again. the best formation for 8 are 1st-if u got good strikers and midfeilders use 3 wide 2 wide midfeilders one between mid and striker and one for striker. Fender, I would recommend a 2-3-1 for 7×7. It will allow for additional support for defense if needed. I’ve coached youth soccer for upwards of ten years and I think I’m in the minority regarding defensive formations. We consistently win with a vertically stacked defense. On an 8v8 format, we play a 1-1-1-3-1. The three vertically stacked defenders learn to support each other. All teams seem to play right down the middle anyway. Stopper takes first attacker thru with sweeper support while center defender guards the weak side and crosses, then starts play up the weak flank. It turns into a traditional 1-2 defense if a team attacks down the sides, but that rarely happens. Without the stack, the wing defenders are confused as to responsibilities of an attacker that splits them down the middle resulting in a 1v1 with the Sweeper. My most aggressive player is center mid while my two most skilled are at R and L midfield to work the ball up the sides to cross to center forward and weak side midfielder. Works really well. Center defender is eliminated in 7v7 format. like to shoot you an email. I’ve got some recommendations for your blog you might be interested in hearing. Either way, great site and I look forward to seeing it develop over time. I think I agree that it really depends on your personnel. It’s very common in youth soccer to have better athletes than soccer players. When we have better athletes, we tend to run a 2-3-2 because we don’t finish our opportunities as often and need more of them to score goals. When we have a soccer player or two, guys that can beat a defender or two and tend to put away balls in the box, we run 3-3-1 and focus more on possession. I fully agree that teaching kids to play outside early is a winning strategy. Teams that play up the middle have to carry the ball up and chase it down often. By playing wide, you force them to run zig zag up and down the field all game while they chase the ball. If you can stay disciplined and keep the ball wide, you should be punishing people in the 4th quarter. Our U11s 8 a side team have recently switched from 331 to 241 (almost 2131) with a defensive central midfielder sitting in front of the back two and with two out and out wingers when we are in,possession who tuck back in when we haven’t got the ball. As coach I am really surprised how little other teams play down the wings. We are starting to develop a definite style of play which is all about quick passing on the floor and to get the ball wide as quickly as possible. A really good way to play if you are playing against physically strong players who put everything down the middle. Results really don’t matter very much at this level. However using 331 we were LLDL; since moving to 241 we are WLLWLD. Hi. I’m Khush from England. I’m gonna apologise in advance as we use football for soccer. I’m in my 30s now and have been playing 8-a-side for a good 15 years now. As a group of players who have been brought up playing football since school we have a squad of 25 players and rotate each week. I have a wealth of experience and we have experimented with various formations before hitting what I believe are the best – the second best and the third best formations. The players have a mix of ability. Some are fast. Some great on the ball. Some skillful dribblers. Some defend aggressively. Some are slow but positionally are strong. We have rotating goalkeepers. 2 central defenders and a defensive midfielder who rarely moves into the opposition box. Crucial to this is the fact that the midfielder fills in when he loses a defender into the wide fullback position or when a defender forages forward down a wing into an attacking play. They form a ‘diamond’ with the goalkeeper being an aggressive player who can call his defenders into position to cover opposition attacks. These defenders must play safe and pass carefully to the midfielders. No panic. No pace necessary. 1 defensive midfielder. Crucial that this guy is positionally aware. Detecting danger. Closing down and breaking up attacks. Prepared to go wide to break attacks coming down the wings. Filling in when one of the 2 defenders gets drawn out. Playing it wide and creating attacking plays. Must not be slow but doesn’t need to be the quickest. 2 are wide. Fast attacking players. Shoot whenever chance arises. Pass or cross into box appropriately. They must mark the opposition fullbacks when the play is with opposition. This is to prevent their GK passing it to them and starting off easy attacks. 1 is central and the fulcrum of the team. He must link with the striker and the 2 wide players. He must close down space to relieve pressure on the diamond behind him. Must score goals from outside box. Must be strong. 1 striker. Comfortably holding up. Not afraid to use strength. Closing down the opposition defenders. This works best when you set it up well. It has brought me great success. 5-0-0 record. The brilliant description of gk-3-3-1 above. Superb all round formation. Relies on pushing up defense. If the team doesn’t move up and back together this fails miserably. Leaving large gap between mid and defense is the root cause for failure here. No striker. Sit back and absorb pressure. Hit on counter attack. Works as a change for pressure relief situation maybe at start of a game to tire out opposition. Then switch to above formations to finish them off. Key to all of these is using right personnel in right position. The goal scoring players must be played in attacking positions. The defenders must be taught to step up and not sit back absorbing. Be aggressive from the striker back and don’t let them pass down the flanks. In defending strategy you should use 4 -1 -2. Counter attack is more effective. I mostly played a 3-1-3 this season with the occasional 3-2-2 and ended up 12-0 this season. I’m intrigued buy the 3-3-1 but don’t want to change things up too much just before our tournament (especially going in #1 seed). Doug – Great article for a first time U9 8v8 coach taking a team that has 120 minutes practice together to their first game. Hi there! I’m from Finland and am a full-time youth football (soccer) coach. The first thing I want to point out is that the article seems to be focused on winning matches rather than on the development of the players. This in itself isn’t a bad thing, but it would be good to mention that winning shouldn’t be the number one priority in youth sports when discussing formations for this age group. Instead it would be beneficial to know, as the coach, what you want to teach the children. The formation isn’t too important as long as you know how the different positions link to 11vs11 play, because that’s the goal in player development. The 3-3-1 formation has a good link to any 11-a-side formation that has two wide players per side; winger and wingback. Not going to stray into the details here, but I want to say that playing with the strengths of a youth team will most likely be detrimental to the players’ development because you don’t focus on teaching when looking for the win. That being said, we have also done something very wrong mentally in the team if the players don’t care about winning. But as coaches, we can’t let ourselves be blinded by the hunt for victory. I have used a 3 – 4 line up but in a diamond formation at midfield. Some may call it a 3 – 1 – 2 – 1. If you have a team limited in stamina and speed then the 3-4 diamond is the better of the two. If you have some athletes then go bonkers. Agree with much of what you have said–except one omission. The best quality a striker can have at this age is a tenacious forecheck. If a striker can run down the other team’s defense and create turnovers, which is easier at this age than teens, then sometimes all he needs is a certain scrappiness to tally up goals. I disagree that we should tell kids that they should never put the ball in the middle and that playing to the outside even if it results in a throw-in is always the best option. The objective of the coach should be to facilitate the development of decision making and the appropriateness of a given decision in a given circumstance.. toe punting the ball as far up the field as possible would have the same outcome in terms of reducing the probability of being scored on but does little to develop proper playing habits ..to become good players, children should be encouraged to take risks and applauded for those efforts even if they sometimes fail which is a necessary part of the learning process and may even result in being scored on!